1970. My dad George Burton looking across to Fords Research Centre at Dunton from our front garden. Our fireplace shortly before central heating was installed in Spion Kop. Peggy the Dachshund keeping my bed warm. Recently I heard that gas prices are to rise by at least 6% and therefore it will be a long cold winter for many low paid workers and their families. It started me off reflecting on how we now take our double glazing and central heating almost for granted. Certainly, the younger generation has never known a time without it. During my early childhood, such things simply didn’t exist. Winter in a plotland bungalow in the early fifties had to be planned for. Wood was collected and chopped into sticks with larger logs kept for storing to supplement the ton of coal we had delivered and tipped into our outside store, (a homemade construction with breeze block sides). This had to be shovelled into a coal bucket and brought inside in all weathers and as the coal store had no cover, this sometimes meant having to plunge the shovel through snow while wearing wellington boots with a raincoat draped loosely over the head and shoulders. Early in the mornings, the tap on the outside water tank would be frozen, so our dad (George Burton) heated a poker which he held against it until it thawed and began to turn. The fire in the kitchen was started with rolled up balls of newspaper, then the kindling and small logs until the fire was hot enough to add the coal. This way, the kitchen was fairly warm when we children were called from our beds and we got washed and dressed for school there. The living room fire would be started later in the day. During the day, the bungalow was always cold and draughty and although it was a couple of miles away, it was almost a pleasure to get to Markhams Chase school each day as every classroom had a lovely warm radiator. We stood our little bottles of milk there to take the chill off it. 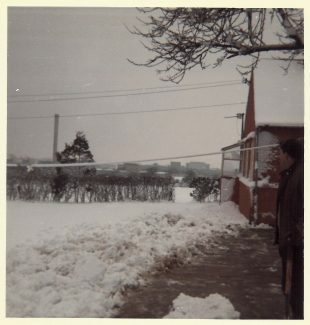 I’m pretty sure the school had solid fuel heating and that Mr Davey the caretaker had to stoke the boiler. I remember everything having to be tucked in when getting dressed. Vests (whatever happened those) tucked into pants, jumpers tucked into skirt. Knitted cardigan put on over the top. Pixie hood for me and balaclava for little brother had to be tucked into the collar of our coat. Mittens or gloves that were sewn onto the coat were tucked up the cuffs to keep our wrists warm. Thick grey woollen knee length socks turned over at the top and secured with an elastic garter which left a red ring around the leg, just under the knee. Just our faces and knees were exposed. That applied to boys as well as girls because in the fifties short grey flannel trousers were worn throughout the winter, exposing the knees to the elements. Boys didn’t go into long trousers until they were around 11 or 12. That event appeared to represent a coming of age. My nan (Jessica Devine) would sometimes remark about the teenage sons of family and friends saying things like “Oh he’s growing up quickly”, with a knowing look on her face. Then she’d wink and say “He’s in long trousers now” as if it was a significant landmark in a boy’s life. One day at school, I couldn’t find my woollen pixie hood and when my dad arrived to collect me on his push bike, Miss Whitley wouldn’t let me go home on the seat on the back of his bike without a hat. So she went to ‘Lost Property’ and sorted out a suitable one for me. I was very glad of it and duly returned it the following morning. On arriving home from school, the living room would be warm, but curtains were hung over doors to help keep out the draughts. That didn’t stop them completely and we often sat in the evening with a blanket around our legs. Chilblains were often suffered and complained about. 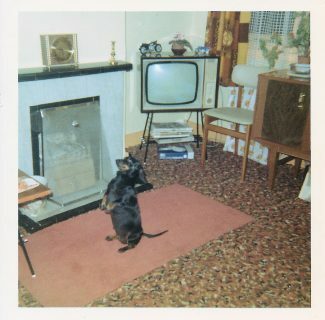 Occasionally in windy weather, smoke would be blown down the chimney into the room, making us choke and we’d try to fan it away with our hands. Preparing for bed involved dressing in winceyette pyjamas and bed socks and filling our stone hot water bottles with boiling water (mum had knitted covers for them). Then piling on as many blankets as we could, sometimes adding our coats on top. Slipping between the cold flannelette sheets and gradually forming a cosy warm nest to sleep in. In the early sixties we tried brushed nylon sheets hoping they would be warmer but they proved to be clingy and uncomfortable, and produced static electricity that crackled and sparked when we pulled the sheets off the bed. We soon realised that natural cotton was best. When I was 16 we got mum a puppy for Christmas. 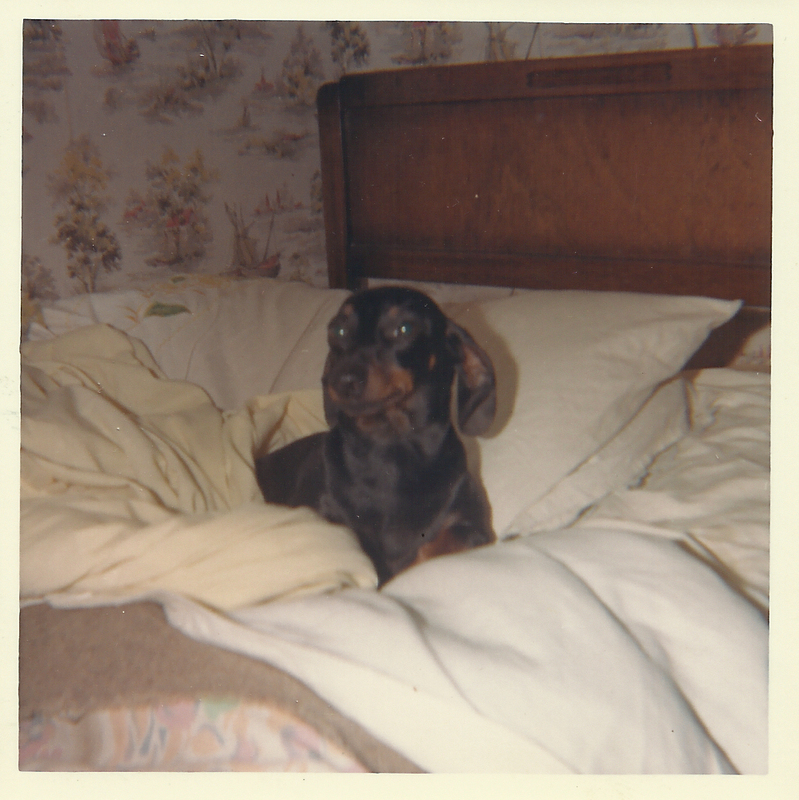 Peggy, a miniature dachshund, decided to share my bed and helped to keep it warm for me. Mum made porridge for breakfast and warming meals such as stews and shepherd’s pie. She knitted jumpers and cardigans, hats, scarves, mittens and even all my dad’s socks which she darned quite expertly on a ‘mushroom’ when they began to wear.The chimney would need sweeping in the spring. My dad had his own set of brushes which he would push up the chimney. We’d stand outside waiting to see them poke out at the top and then shout excitedly to tell him they had come through. Mum would catch all the soot in a sack and dispose of it. A winter’s smoke would take its toll on the wallpaper making it dingy so my parents often re-wallpapered. Those were great occasions. Mum did a tour of the shops in the High Road to choose the wallpaper. Usually quite bold flowery patterns, complimented by cream paint on the skirting boards. She would then sit and trim the borders off the edges with scissors. Dad made the paste himself from flour and water and we all sang ‘When Father Papered the Parlour’, as the sticky gooey stuff was slapped onto the strips of paper with a wide paste brush and then hung on the walls (sometimes over a previous layer of wallpaper) and we would all check for bubbles that needed to be poked with a pin and smoothed out. http://www.youtube.com/watch?v=39wx7UeTXfw Oh that song brings back some wonderful memories and I can almost smell the paste. When not singing, we’d listen to ‘The Goon Show’ on the radio. As dad worked his way around the room, occasionally one sheet he had previously stuck in place would start rolling down from the top. We’d laugh and shout to him and he’s hurry to stick it back again. On occasions when the walls were stripped to the plaster, dad drew cartoons or caricatures on the walls, which wouldn’t be seen again until the wallpaper was stripped off again the following year and made us chuckle. In the mid-sixties I sketched a picture of my beloved Beatles together with Ringo’s drum kit and was so pleased with the result, I was reluctant for dad to cover it with wallpaper. We children were always delighted when told the old wallpaper was to be stripped and we could start pulling it off. We loved doing that and a favourite trick was to stick a finger in a corner of the room and run it down, breaking the paper and then rip off as much as we could, attempting to peel off a whole sheet without tearing it. We had a couple of paraffin heaters and in 1957 when the electricity was connected we had a small two-bar heater. Thus we survived and even enjoyed the cold winters. Laughing at the milk that had frozen in the bottles on the doorstep which had pushed up through the neck of the bottle with the silver top perched on top. Taking in large breaths of air on the way to school and blowing it out to see what the cold air did to our hot breath. Hooking long pieces of grass into a circle and scooping up spider webs that twinkled like diamonds in the frost, seeing if we could get the whole web without breaking it. Making snowmen and having snowball fights until our fingers and faces tingled with the cold. Sliding on the ice in King Edward Road on the way to school and on one occasion when I was 12, falling and injuring my ankle and arriving very late after having to hobble very slowly. Mr Cluff arranged for me to be sent to Casualty at St Andrews Hospital. An x-ray showed that it was a severe sprain, so I was bandaged tight from toes to just below the knee. I couldn’t bear the weight of the bedclothes on it at night, so had to sleep with my foot in one of my mum’s shopping bags. I was off school for two weeks and limped for a third week. Frost, ice and snow made our unmade road easier to negotiate as it became hard and crisp to walk on and for a couple of months, our shoes didn’t get muddy, until the thaw started in the spring. Yes, it was very cold but with a little tenacity we survived and managed to stay cheerful.The weeks leading up to Christmas were popular with the local children for Carol Singing. We never had any come to our bungalow because of our unmade road, but many little groups of children could be seen walking from house to house in Laindon, knocking at doors and singing for a bit of pocket money. Probably the same ones that had been doing ‘Penny For the Guy’ in November. I remember one boy from our school who always went Carol Singing on his own. He could often be seen in the late afternoon going from house to house, singing very loudly. I thought that was slightly strange but very brave of him. I only joined in once when I was 13, along with two friends, Geraldine Moore and Brenda Holt with the permission of our mothers. We went along Devonshire Road, down King Edward Road, along the High Road and then into the Pound Lane Estate. We mostly received pleasant responses and were even invited in by one lady to sing to her two little toddlers who were ready for bed in their pyjamas. They sat on the rug in front of the fire while we sang. We chose a couple of soft lullabies, ‘We will rock you, rock you, rock you’ and ‘Away in a Manger’. That was a lovely moment. We were only told to ‘go away’ once, when a man shouted at us in a gruff voice from behind a front door, needless to say, we ran away quickly. On crossing the High Road and entering Holst Avenue, we were spotted by a couple of boys from our school who started laughing and following us around. We asked them to go away and leave us alone but they responded by throwing handfuls of mud and scored a couple of hits on the cream coloured wool coat that one of my friends was wearing. She was worried her mother wouldn’t be too pleased, so we hurried on until we reached my brother’s house. There, my sister-in-law kindly sponged the mud off as she sighed and muttered ‘boys’ under her breath. Thus ended our Carol Singing adventures. Central heating arrived in the mid-sixties. As a teenager, conversations at work turned to whether to go for gas or solid fuel. How many radiators to have and whether the rubber plant would suffer if kept too near a radiator etc. I believe a back boiler and three radiators cost about £1,000 to install at that time. I remember the Baxi Bermuda being a popular choice. My parents eventually had a solid fuel system fitted, back boiler and radiators, along with some secondary double glazing. A warm home throughout felt luxurious and over the years became the norm. In fact, these days I feel that many people keep their homes a little too warm. Certainly when she lived in a warden controlled flat in Cromer Avenue during the seventies, my nan had her heating turned up so high, it made us feel sleepy and uncomfortable and it was a relief to step outside into the cooler air. She was probably over compensating for all the cold winters she had endured earlier in her life.I’m not saying that we should go back to how it used to be but I feel we could all save a little on our heating bills this winter by wearing an extra layer of clothing and turning the thermostat down a degree or two. Perhaps we might also catch fewer colds, as germs multiply in very warm conditions. I remember a few days before my mum died in January 1994, helping her into bed one evening and tucking her in. There was a long radiator on the wall alongside her bed. I said “At least you have a nice warm bedroom now, unlike when we lived in Spion Kop when the net curtains were stuck to the icy windows in the mornings”. She smiled weakly but her reply really surprised me. I had been expecting ‘Yes, isn’t it wonderful’ however she said “I suppose so, but I can’t help missing that lovely feeling of climbing in between cold sheets, snuggling down and gradually warming up through my own body heat. There was something comforting and satisfying about that”. I was rather taken aback, but after having a think, I began to understand what she meant. I feel privileged to have been part of the generation that experienced the era before central heating and double glazing, only we can fully appreciate the changes that have taken place over the last 50 years. However, as I switch off the central heating on the way to bed each night this winter, I will remember my mother’s words as I pop my wheat-filled hot water bottle into the microwave oven to heat up. Keep warm this winter everybody – but not too warm. There seems to be rumour circulating (aided and abetted by Messrs Mott and Diment) that I live in Canada. I did in fact live, for a limited time, in Toronto where I soon realised that Canadians are the most courteous and friendly people I had ever met and that Toronto was the cleanest and most graffiti free city I had ever come across. I have nothing but good to say about Canada and Canadians. Except for the winters! Toronto does not get nearly as cold as Calgary but since mother did not raise a masochist I decided to leave whenever it became possible. After one winter, and with my business consultancy completed and retirement ahead, I realised that I did not wish to face a second winter. For the last sixteen years I have been retired in a slightly warmer clime. Savannah, Georgia. It was a very interesting and humorous memory recounted by Alan Davies, but it did occur to me that as he now lives in Canada he would have considered the conditions he writes of to be just mildly chilly. My son who lives in Okotoks near Calgary tells me temperatures of minus 16 degrees celcius are quite normal for winters there. William. Thank you for asking, but it wasn’t my dad who you remember. That must have been somebody else with the same name as we know there was at least one other George Burton in Laindon around that time. Alan. Visits to the outside loo at night were the best! I was scared of the dark when very young, so had to wake one of my parents who would stand outside on the path with a torch and wait for me. I know what you mean about cockerels. My mother was attacked once by one of ours when she went to collect the eggs while holding my baby brother in her arms. It was a vicious attack and my older brother had to beat it off with a garden spade. Thankfully they escaped unhurt but shaken up. Joan. My brother was five years younger than me, but I was allowed to stay at home with Scarlet Fever, but in isolation. I remember feeling quite weak and eventually bored. There was a calendar on the wall in the room and I kept counting the numbers on it. I asked my mum to remove it from the room as it was driving me barmy. I received a similar response on returning to school as you described. The only people that mentioned my absence and asked how I was were the two dinner ladies Mrs Temple and Mrs Randle. They were surprised to hear I hadn’t been sent to hospital. My daughter had scarlet fever in 1979 just after she started school. Her temperature was 104F. She improved with antibiotics but relapsed twice. Dr Cavaroli came out on each occasion (we have such good doctors in Laindon) and said the dose apparently was insufficient so prescribed a third course which did the trick. I have since read about Scarlet Fever and apparently it is now referred to as Scarlatina because it has become less serious. Interesting. Many of the memories outlined mirror my own. Two additions not otherwise mentioned. Monday was the universal washing day. Why every mother/wife chose the same day of the week, every week, to wash clothes I never did understand. Perhaps it was as routine as church on Sunday wash on Monday. The freshly washed clothes would be pegged on the line in the garden to dry. Except that in the winter they did not dry. They froze! Thus the sight of garden after garden with what appeared to be spectral scarecrows wafting in the breeze. Or more often waving wildly in the fierce wind. Once in a while a spectral frozen shirt would break loose from its pegs and go cartwheeling across the garden, down the street, and into a field. By Wednesday or Thursday of continually freezing weather the mothers/wives gave up the ghost and brought the frozen clothes into the house. They were draped over chairs in front of the fire to encourage drying. This accomplished two things. It denied any family member the chance to warm up in front of the fire and produced enough moisture that the walls of the room became wet with moisture. The law of unintended consequences! By this time the now dry clothes were a dull grey colour caused by being outside for days in the smog and the wind. Not to worry. They would get washed again the following Monday. We had the near universal outside loo. We also had a fiercely territorial cockerel who jealously looked after his harem of five or six hens. It usually was dark before five o’clock in the winter. A visit to the outside loo was an adventure in itself. First don an overcoat because there was no difference in temperature outside the loo to that inside the loo. Then a torch. This was necessary not only to safely pick one’s way in the dark but to see what one was doing when one reached the loo! In the other hand a broom. This was necessary in order to ward off the attacks of the Mad Cockerel. So imagine the sight. A dark night. Someone in a loosely put on overcoat which would sometimes get blown about by the wind. The torchlight beam which swept the area looking for a safe place to land the next shoe and at the same time to give warning of a pending cockerel attack. In the other hand an upraised broomstick to repel any such attack. Any continuing narrative of events after the loo was reached and the door safely latched are best left to the imagination! Ah! Happy days? Regarding the article by Mr. Diment about scarlet fever. When I had it I was about 8 or 9 years old, this made my sister 16 or 17. My mum told me years later, that if there had been younger children in the house, then I would not have been allowed to stay home. Also I had to use the same cup plate knife and fork to stop passing the infection on. I don’t remember much more about it except I had the most awful sore throat and couldn’t swallow without a lot of pain. I wonder if they have finally managed to get rid of the disease as I can’t remember the last time I had heard it mentioned. In her original article, Nina mentions that her father was named George Burton. This stirs a chord in my memory. Did he ever work at Coles Bodybuilders on the Arterial Rd.? I can definitely remember Ken Porter’s dad working there. This was pre-war, circa 1936/1937. Reading the memories of days gone by caused me to consider how much medical opinion has changed in respect of certain diseases. Joan recalls lying at home in a bedroom with a fire and shared with her sister while she (Joan) was suffering from scarlet fever. Nina also remembers being similarly afflicted. During the mid 1920’s I lived in east London and there was an outbreak of scarlet fever to which I succumbed and was sent to an isolation hospital in Dartford. The wards had double sash windows the top half of which were always left open, even at night. I remember when I had scarlet fever, I’m not sure how long it lasted but it seemed forever. When my mum was told I could go back to school, it was during a really snowy winter. After being indoors for so long, I was walked up to Langdon Hills School in deep snow, I can remember to this day how cold I felt. I was in Miss Wendon’s class at the time, and I can remember her asking my mum if I was completely free of infection!!! All I could think about was that I could have stayed at home a bit longer. Not one person in the class asked me where I had been, but they were doing some topic at the time and no one showed me what I was supposed to do. Isn’t it funny what sticks in your mind from your childhood. I can also remember in one of the classrooms at Langdon Hills, there was a picture on the wall that I liked, years later I realised after seeing it in a book, that it was Picasso’s boy with a dove, I have now got a print of it in my lounge and it brings back such school memories. I couldn’t have timed my article better as we awoke to a layer of snow this morning and it’s still falling heavily. The back garden looks beautiful. We moved into this house 31 years ago today and it snowed then too. William. I believe Markhams Chase School had stoves in the classrooms in earlier years but had changed to radiators by the time I started there in 1951. That’s very interesting about the stuff that smelled of menthol, I wonder what it was exactly! Joan. You and I have much in common. I have a sister 7½ years older than myself and we shared a bedroom, although we had twin beds. My bedtime was earlier than hers and at one time I was scared of the dark, so I used to hide under the bedclothes until she came in an hour or so later. Like you I also had scarlet fever. I was 7 or 8 years old so it would have been 1953/54. Dr Chowdhary told my mother I must be kept isolated, so I had the living room to myself. I slept in the put-u-up settee and the rest of the family had to live in the kitchen. I think this was arranged to prevent me having to go into hospital, as scarlet fever was still quite serious in those days. I was off school 2 or 3 weeks and Dr Chowdhary trudged all the way along our unmade road every couple of days to check on me. What a hero! I’ve also remembered it was around 1970/71 when Spion Kop was fitted with central heating. That was two years after I had married and moved out. Smokeless fuel was being used then and I think it was called Anthracite which looked like pebbles rather than the large chunks of coal previously used. Spion Kop only benefited from this heating for about four or five years as it was compulsory purchased in 1975. Best wishes and don’t forget to wear your thermals everybody. I’m on a roll now. I remember watching the coal being delivered and tipped into our coal store. Some chunks so large that they wouldn’t fit into the fireplace let alone the coal scuttle, so my dad used to break it up with a pick axe. Some pieces had ‘fool’s gold’ inside that glistened. Apparently, that was pyrite. I can remember and relate to much of Nina’s memories of cold winters, such as waking up in the morning with ice coating inside bedroom windows. However she writes of arriving at Markhams Chase school with its warm radiators. This was not my memory of Donaldson’s School where we had a large combustion stove in the middle of each classroom. Sometime during the morning, the caretaker would come in open the top of the stove and insert a shovel full of some substance which gave off a dense white cloud smelling of menthol, which was supposed to ward off the winter germs. We welcomed his appearances, as it gave a respite from school work until the cloud dissipated. One winter pastime which was denied us was that no slides were permitted in the playground as there was a slope and boys would crash into the iron fence. Often we were kept in at playtime and I believe this may have been reluctance on the part of the teachers to stand in the cold and supervise to ensure no breeches of instructions took place. Classroom discipline certainly improved in winter as no one wanted to incur the normal penalty of being banished to the cloakroom for a period, as there was no form of heating there. This made lovely reading Nina, and reminded me so much of our cold bungalow in Sandringham Road. We never did get any central heating but one of my favourite memories was of having a small fire lit in the bedroom when I had scarlet fever. When the light was switched off, you could see the fire flickering which was so nice and comforting. I shared a bed with my sister Val who was eight years older than me. We had a flock mattress, do you remember them? Val would work all the flock on to her side, manage to build a wall of flock between us which left me with the ticking on the old springs !!! I have reminded her about this over the years, I am surprised I still like her !!! Hi Nina great article. Interesting comments on heating my chosen trade as I am at present the district heating engineer for our council and those words are so true “cooler houses would benefit us all and your own body heat under a quilt is a much healthier way of warming up before sleep”. Also of interest is you mention of Cromer Avenue warden controlled scheme this was one of my sites until 2007/8 when it finally gave up. Originally oil fired until 1986 then converted to gas plant as was Arne Court. They now have their own boilers but communal is a great way of heating if its done right. But no matter how hot some of the elderly have their homes in all 20 district heating schemes I look after in this area all the resident like a cold bedroom just as mum says.